Provide comfort for the family of David Booth with a meaningful gesture of sympathy. 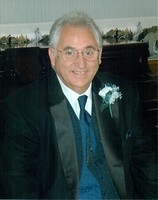 David W. Booth, of Onset, MA, passed away on April 5, 2019 surrounded by his family. He was born in Medford, MA on Feb.18,1944 to the late Wallace Booth and Elsie Booth. He grew up in Somerville, MA and graduated from Somerville High in 1961. He continued his education at Wentworth Inst. in Boston. He later joined the U.S. Air Force in 1964 and was deployed to Vietnam in 1967. After being honorably discharged for his year of service he moved to Onset, MA. There he started a General Contracting business until his retirement 48 years later. David was a priesthood member in the Community of Christ Church. He served on the Onset board of trustees for the church for many years. He was also lifetime member of the Marion VFW. Most importantly he enjoyed spending time with his family and friends, but the most precious time was with his grandson, Alex. He is survived by his ex-wife and caregiver Marlene Booth of Wareham, MA. as well as his two sons, Mark Booth of Middleboro, MA and Matthew Booth of Onset, MA, his daughters-in-law, Stacy Booth and Leeandra Booth, his grandson Alexander Booth, his brothers, Fred Booth of Claremore, OK, R. Dale Booth of Onset, MA and Wayne Booth of Hyannis, MA. He also leaves behind many nieces and nephews. In lieu of flowers and gifts please donate to a charity of your choice in David’s name. Funeral arrangements will be under the care of the Bartlett Funeral Home, 338 Court Street, Plymouth. Calling hours will be held on Thursday, April 11th from 5-7 pm at the funeral home. Interment will be at the Massachusetts National Cemetery in Bourne, MA at 9:45 am on Friday, April 12th. David has been a part of my life as long as I can remember. He always had a smile and a soft voice, even if he was correcting errant children. His joy for life was blatantly worn on his face, even when he was tired. He was my hero one year. letting me use his washer and dryer to clean over 30 tie-dyed t-shirts for Reunion without any concern if his own laundry would be multi-colored the next time it was washed. His depth of memory for the "care and feeding" of the Campgrounds and his love for our Onset Community will be missed for a long time. Rest well, my friend.